Would you like to help your local wildlife and improve your sustainability? 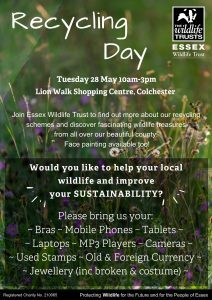 Join Essex Wildlife Trust on Tuesday 28th May, from 10am – 3pm to find out more about their recycling schemes, and discover fascinating wildlife treasures from all over! They are also seeking your help by donating various recycling friendly products (see poster) and offering face painting!